It took 6 years, in an era when post offices were being lost to communities larger than Glade Park, for Glade Park to once again have a permanent Post Office... sorry, the USPS official description of it is "covered kiosk." That means as far as USPS is concerned it is just a place to pick-up mail, without a service window. But due to the determination of the current sub-contractors who bring the mail and sort it, there is still a service window. Do not take it for granted. It could go away. 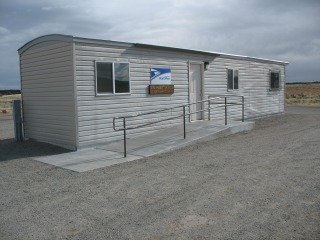 This modest building was donated to the community by the USPS, and made possible by the efforts of Mesa County and Glade Park Community Services. Mesa County advocated for Glade Park, and donated the land and improvements where this building now sits. Many residents, some of them as Glade Park Community Service officers, donated countless hours negotiating, getting blindsided by USPS, burning out and handing it off to a fresh team, until the present result finally materialized. As a service to the community, Glade Park Community Services operates the building. However, it belongs to the community as a whole, and requires ongoing donations of tim, effort and money to maintain it. If you are in any way critical of the present post office and how it is operated, or just interested in the whole 6 year saga, please scroll down this page and read the whole story. You might want to go to the bottom and work your way up so it will be in chronological order. Be sure to take the Como side trip. After you have done your homework, then you may respectfully offer suggestions that may be helpful. Things are the way they are pretty much out of necessity. A lot of sweat and tears went into it this result. I am reluctant to try to list all of those individuals who played a role, for fear that I will miss someone. The players know who you are - and we thank you. Hopefully most of you recieved the notice to all Glade Par box holders dated November 4, 2011 which summarizes the near term plans for transitioning over to the post office located on the Glade Park School road. What is important to remember is that this new post office must be self-supported, and the community is suggesting a minimum donation of $20 per boxholder to cover the cost of the insurance, utilities, and one time electrical hook-up. The Glade Park Community Services is setting up a distinct bank account to manage the funds appropriately. Larger donations are also appreciated. We do not yet know how well the minimum donation will cover necessary upkeep. It takes a lot of scrolling, and a side trip to the Como Chapter, to get to the bottom of this page. It chronicles the Glade Park Post Office saga, which began in March, 2006. For those who have been following the story line, the elusive trailer intended for the Glade Park Post office has finally returned from it's Como side-trip, and made it as far as Grand Junction. The Glade Park Post Office committee has continued to deal with the challenges of how a small unincorporated community is going to come up with the resources to set up and maintain a post office building, when there are no options for putting it in a local business. Thankfully Mesa County has been a partner in this challenge almost from the beginning. They have recognized the impracticality of people having to drive that far for their mail. The USPS has always made it clear that the present trailer is not permanent and could go away at any time. It would create more traffic, and wear and tear on the roads - which are maintained by Mesa County. While the USPS has reversed positions, and broken commitments several times, Mesa County has been a consistent and dependable partner. With their assistance it appears that there may finally be a resolution to this dilemma. A long-awaited trailer needed to serve as a post office for the Glade Park community has arrived in Grand Junction, and Mesa County is preparing its final destination. The U.S. Postal Service moved the trailer from the town of Como in central Colorado to Grand Junction. The move should be complete “very shortly,” Grand Junction Postmaster Daniel Reyes said. New post-office boxes have been ordered and are expected to arrive soon, he said. Mesa County in the meantime is pouring footers, preparing to make it accessible to the disabled, working on electrical connections and making other preparations for the trailer, which will sit on a pad that the county built on Glade Park, Mesa County Commissioner Craig Meis said. The Daily Sentinel's recent coverage of the Glade Park Post Office quest has presented some options being explored as if they are a done deal. Please do not make assumptions. The situation is still fluid, and will take additional time to play out. The committee does not want to be secretive, but simply cannot risk jumping to conclusions or spoiling a good alternative. The Glade Park Post Office Committee, Mesa County, and the USPS are continuing to talk about options for a Glade Park Post Office. Mesa County has shown genuine interest in helping us find a solution, including providing a site for the Post Office. The USPS has backed away from previous commitments, saying that they do not have funds available, and do not plan to have them available. Only a few months ago they produced drawings of the proposed structure, so we know that they are going in reverse. Several years of good faith effort on the part of GPCS,and Mesa County do not seem to matter. However, some caution is also being exerted because the present trailer is temporary, and could also go away. You will be hearing from the GPPO committee soon on what will be the next step. No final decisions will be made without consulting the community. A committee has been formed to explore the progress on a permanent Post Office for Glade Park. The committee is still at a planning and fact finding stage. Findings will be released to the community as progress has been made. The committee is a cooperative effort between Glade Park citizens and Mesa County. Although 3 members of the Glade Park Community Services, Inc. (GPCS) Board of Directors are on the committee, the committee itself is separate from GPCS. GPCS members are President Lynn Grose, and Board members Jeannie McLain, and Deb Moorland. Other Glade Park citizens are Jon Bilbo (Committee Chairman), Susan Bilbo, Jim Joslyn, Joyce Little, Holly Moody, Jeri Moody, and Doug Underhill. Mesa County is represented by Mesa County Commissioner Craig Meis and Stacey Mascarenas. Glade Park has had a temporary Post Office, on GPCS, Inc. property, since shortly after it was removed from the Glade Park Store, in March, 2006. For 3 years, an ongoing dialogue with USPS. has been facilitated by GPCS, Inc. and Mesa County. Due to the ongoing burden on GPCS, whose mission is to maintain the community building, it was decided that it was time to formalize the effort, and move it outside of GPCS. After a long courtship with USPS, involving the purchase of land for the designated purpose of building some kind of postal facility (even if it is only a “kiosk,” ) the community of Glade Park, and Mesa County, have been left at the alter by USPS. They were involved at every step of the way, and had even, as recently as January, produced drawings for an actual building. Now that the land deal has closed, and Glade Park Community Services has pressed the question of when the temporary trailer would be moved from their land to the newly acquired spot, the USPS reverted to its previous position of throwing the building back into the lap of the community. The new Postmaster, Dan Reyes, does not seem to be bound by honor, or any other implied acts, to previous agreements. 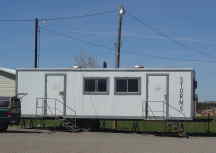 He has told GPCS board that they are once again considering closing the temporary trailer because of the expense of renting it. Anyone who wants to refresh their memory on what we have already been through can scroll on down this page. We have been here before. The resulting community survey showed clearly that the community was not willing or able to take on the ongoing expense of upkeep on a building. The few who were willing cannot support the whole effort. There is not even an entity to do so. The mission of Glade Park Community Services, Inc. is to maintain the community building. When we put it back in the lap of USPS it appeared that they were stepping up to do the honorable thing. But now after leading us down the garden path for YEARS (since March, 2006), and letting Mesa Country make the land purchase, the USPS has come full circle. Now they tell us that they would donate some old used boxes, and deliver mail to a structure we provide, and maintain. On what acts of good faith would we base the enormous effort it would take to build and maintain a building? How do we know our on-again off-again suitor would follow through with their end of the deal at that point? And what if we cannot meet their ultimatum? I want to make it clear, I am speaking as an individual, not as a board member of Glade Park Community Services, Inc. I do not think we should move a muscle toward dancing another minuet with USPS. I think that we should refer them directly to the Code of Federal Regulations, Title 39 – Postal Service , CFR 241.3 - Discontinuance of post offices. They must also consider “Views of postmasters. Whether the discontinuance under consideration involves a consolidation or not, the district manager, Customer Service and Sales, must discuss the matter with the postmaster (or the officer in charge) of the post office considered for discontinuance, and with the postmaster of any other post office affected by the change. The manager should make sure that these officials submit written comments and suggestions as part of the record when the proposal is reviewed.” We already saw the impact on the main Post Office, when they had to open a separate window to disburse our mail. Where would they put the proposed 1000 boxes we are being urged to put up a structure for? If they are going to build, why not do it on Glade Park? How does it make sense to increase traffic on City of Grand Junction, Mesa County and Colorado National Monument roads? And at a time when we are all supposed to figure out how to be more energy efficient, how does the increased fuel use and pollution make sense? The regulations go on and on. What I am trying to illustrate, is that, based on the 39 CFR 241.3, the USPS is required to enter into a lengthy process of inquiry, public input, and accountability for their consideration of closing the Glade Park Post Office. Rather than spending time and effort on that cynical task, I purpose that they put that effort into following through with their mandated responsibilities to this community. We are not asking for the world. We would accept a cluster box set-up on the property already acquired for that purpose, and continuance of service to a community that has received mail service since the late 1800’s. If anyone would like to paste this commentary into a fax, letter or email to Congressmen, County Commissioners , Postmaster Reyes or his superiors, or anyone one else who might be helpful, you have permission to do so. Add your own comments. Just make sure your voice is heard. To Review the Federal Code follow these links. Although the deal is still in the making, it appears that the US Postal Service is close to securing a place to put a kiosk for dispensing mail to this community. When they did an assessment of rights-of-way for putting up cluster boxes they came to the realization that they did not have enough room available (suprize, suprize!). The kiosk will not be manned, so we will have to mail packages, etc. in Grand Junction. The Glade Park Store does sell stamps. For those who presently have post office boxes it will be a step down, since there is now a service window at the trailer. But for those who are waiting for a post office box, it will at long last be possible for them to get one. For those who are disappointed, it is important to remember that the hardship of constructing and maintaining a post office building was thrust upon the community, and found to be too heavy a burden, without unanimous support. The kiosk will be provided by the USPS, as it should be. By the way, Webster’s' Unabridged defines a kiosk as: "1) a kind of open pavilion or summerhouse common in Turkey or Iran. 2) a similar structure used as a bandstand or newsstand, etc." That doesn't exactly put us on the cutting edge of civilization, does it? Jun 25, 2007, Why are 20 Glade Park post office boxes sitting unassigned when many are waiting for them? We have all been waiting to see what will happen with the post office, especially those who have been waiting for a long time to get a Glade Park post office box. I hear that about 20 empty boxes are just sitting there unassigned, due to the state of indecision about what to do about the mail on Glade Park. Those who do not have boxes still have the right to receive mail without charge, so they have to use "General Delivery", and have the inconvenience of having to pick it up during the window hours, or PAY for a P.O. Box in town. Why can't those empty boxes be assigned? On a spring day in March, 2006 the US Postal Service did the unthinkable. They came into the Glade Park Store and dismantled the post office. They carried away the post office boxes and the mail, and took them down to the main post office in Grand Junction. This created an anomaly, a disruption in the time/space continuum that Glade Parkers were hardly capable of grasping. For almost a hundred years the Glade Park Store and the Glade Park Post Office had never been considered as separate entities. They had complimented one another, providing a convenient place to meet and greet neighbors, while picking up the mail and a carton of eggs. Continuity… community… it was all turned upside down. Those of us with Post Office boxes received a letter on March 31 from the USPS informing us of the situation, and presenting centralized delivery or “cluster boxes” as the likely solution. While still in a state of shock, we dealt with the inconvenience of having to go to the main post office in Grand Junction, during window hours, find parking, and stand in line to get our mail. Some working people had to take time off to get there during window hours. Phone calls were made to senators, county commissioners, anyone who would listen. After a few days they did open a window for us, and extend the pick-up hours. But it was little consolation, especially for those who had to make a trip to town just to get their mail. Therefore our outrage was appeased somewhat when the USPS rented a trailer, which was placed next to the Glade Park Community Services building, with our old post office boxes installed in it. It opened on April 10, 2006, and was staffed by a USPS employee, who sorted the mail, and was available at the window to sell stamps, accept packages, etc. The extended hours of accessibility were appreciated. But we were assured it is a temporary situation. The Glade Park Community Services organization, headed by President Dave Brach, assumed the leadership role, and helped arrange a hastily called meeting at the Community Services building. The crowd spilled out to the parking lot. People stood at the open windows, trying to hear what was being spoken inside, hollering out questions that had already been responded to, though not always answered. Inside the air was electric. At times voices were raised. A Mesa County Deputy stood by the door, looking calm but alert. Several points became clear as soon as we were able to accept them. We would not know the reason the post office was removed from the store. It was and is confidential. The post office would not be moving back to the store under any circumstances. Moving on. The U.S. Postal Service said that funds were not available to build a new post office, and they would not be delivering to private boxes at each home. They were willing to put in “cluster boxes” throughout the community. There were numerous objections to this alternative: security problems, no window services, lack of climate control for things like medications and baby chicks, and a loss of the sense of community that comes with a place were all paths cross. By the end of the meeting we knew that hope of a central post office soundly rested in our own collective lap. More meetings were held, each one attended by fewer people. There was a strong movement to put together a plan to put a building on Glade Park Community Services property, next to the Community Services building. Although they had funds to acquire property, buy and install cluster boxes, employ a delivery person, and run a delivery truck around delivering to the boxes, the USPS assured us that they did not have funds to contribute to construction and/or maintenance of a centrally located Post Office building. Grants and contributions in materials and labor would be pursued, along with tackling the Mesa County regulations, etc. But the efforts went on, headed up by GPSC President Dave Brach. Laura and Jerry Livingston, owners of Livingston Construction, volunteered to be general contractors. The June 7, 2006 Community News listed ongoing work in the areas of: property survey, zoning, major site plan, building design/placement, title work, traffic survey, and back-up plan. A community survey was conducted. The results were published in the Fall, 2006 GPCS Community News. The results were similar, in effect, to the old after-shave commercial where the user received a brisk slap on the cheek, and responded with “Thanks, I needed that.” It appears to have caused GPCS to step back and take stock. Of 446 surveys mailed out, 264 (59%) were not responded to, 173 (39%) were “returned valid.” Of those who responded, 72% preferred a central post office, with 21% preferring the cluster units, and 6% with “valley elsewhere, don’t care.” Of those who wanted a central location, 64% wanted a building, and 14% voted for a kiosk. While the central building plans indicated that there would need to be some funds for ongoing maintenance, only 72% of those who cared enough to respond were willing to donate $2/month to that end. The efforts to find grant funds had also come up empty handed.